In this fascinating memoir, the author and publisher Roberto Calasso meditates on the art of book publishing. Recalling the beginnings of Adelphi in the 1960s, he touches on the Italian house's defining qualities, including the considerations involved in designing the successful Biblioteca series and the strategy for publishing a wide range of authors of high literary quality, as well as the historic critical edition of the works of Nietzsche. With his signature erudition and polemical flair, Calasso transcends Adelphi to look at the publishing industry as a whole, from the essential importance of graphics, jackets, and cover flaps to the consequences of universal digitization. And he outlines what he describes as the "most hazardous and ambitious" profile of what a publishing house can be: a book comprising many books, a form in which "all the books published by a certain publisher could be seen as links in a single chain"—a conception akin to that of other twentieth-century publishers, from Giulio Einaudi to Roger Straus, of whom the book offers brief portraits. An essential book for writers, readers, and editors, The Art of the Publisher is a tribute to the elusive yet profoundly relevant art of making books. 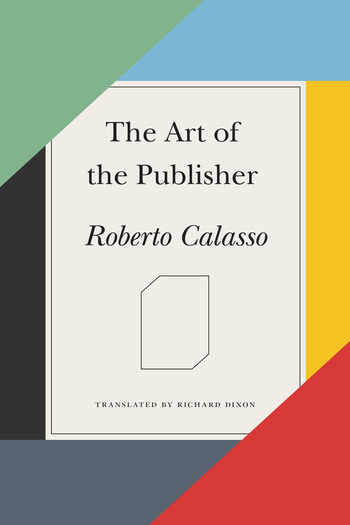 Roberto Calasso is the publisher of Adelphi Edizioni in Milan and is the author of a work in progress, all of whose parts deal with highly diverse materials yet are closely interconnected, and which up to now comprises The Ruin of Kasch, The Marriage of Cadmus and Harmony, Ka, K., Tiepolo Pink, La Folie Baudelaire, and Ardor. Richard Dixon lives and works in Italy. His translations include The Prague Cemetery and Inventing the Enemy by Umberto Eco, and he is one of the translators of FSG's edition of Giacomo Leopardi's Zibaldone.